Photo by F Delventhal licensed under Creative Commons Attribution 2.0 Generic. Yesterday I was walking up the mountain at my sister’s house, with SweepPea in the Ergo. 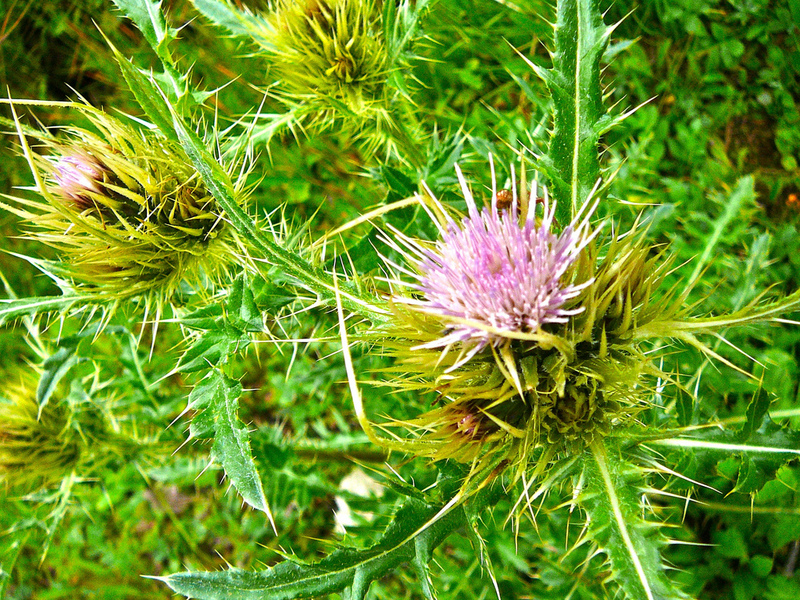 Coming back down, I tripped in a spot that was covered with a prickly, thistle-like plant. I had tried to go around the prickles, but the vegetation was hiding a pile of loose rocks that made the steep slope even more treacherous. I lost my footing and came down on my left knee, a rock jammed into the soft spot below my kneecap. I wasn’t sure if I’d be able to make it down the mountain at first. I breathed into the pain, and eventually it subsided enough that I tentatively tried a few shaky steps. Thankfully, I was able to make it down, but my knee was bruised, and I had a noticeable limp, especially on stairs. Today I climbed the mountain again. There is only one path, so I had no choice but to go through the same troublesome spot. Going up was easy, but I hesitated when I went back down. 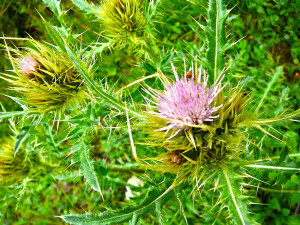 At first, I tried to avoid the prickles just like yesterday, but slower. After gingerly testing a few spots, I realized that there was no safe way around the prickles; I was going to have to go through them or risk another fall. Had I been alone, I would have taken the risk, but I felt really lucky that SweetPea hadn’t been hurt during my previous fall. So I plunged into the prickles. And to my surprise, they really weren’t that bad. I didn’t even get scratched. And best of all, my footing was sure. But if I choose that “easier” route, I risk damaging our relationship. I show her that her inner experience, her emotions are less important than appearing to have it all together. I teach her that her footing in life is only sure if she is keeping me happy. Instead, I choose the prickly path. I hold her when she cries. Even if the reason for the tears seems unreasonable to me, for her, the hurt is real. When our needs collide, I try to find a way forward that we can both be happy with. And more often than not, I find the way is not as hard as I thought it would be. What obstacles are in your path to being the best parent you can be? What would it take for you to move past that obstacle? Tell me in the comments. I’m convinced this doesn’t end after the toddler years. With the kiddo being 6wks away from 13, we’re starting to see some probably quite normal yet frustrating teen behaviors. Some of them are totally out of character. It’s easy to just want to punish or lecture, but I’ve had to stop and remind myself on more than one occasion that these behaviors don’t happen for no reason and that as we get into the teen years especially, it’s better to know and discuss the reasons. Ensuring a trusting relationship in which we actually communicate is worth enduring a few minutes of teen attitude if it means we can push through that to have a real discussion. It’s better for all of us. It makes us better parents and it helps the kid make sense of what can be a very difficult age. My general strategy toward discipline has always been less about punishing and more about creating teachable moments, but there are times when have to remind myself of this. You are so right… we have to keep those teachable moments in sight, look for the reasons behind the behavior, and build trust in the relationship. I’m sure I’ll be coming to you for advice and support when SweetPea hits her teen years!